The 26.64 metre motor yacht Flying Visit has been listed for sale by Alexis Colin at ABYS in France. 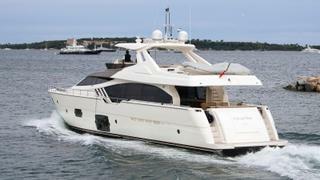 The first hull of the Ferretti 870 model, successor to the highly successful Ferretti 830 series, Flying Visit was built in GRP by the Italian yard and launched in 2012. She is another co-operation between Studio Zuccon International Project and the Ferretti Group. This new aggressive design is characterised by a bronze roof above the wheelhouse and large windows on the main deck and in the hull. RINA classed, Flying Visit has an improved layout giving her far more volume. She accommodates eight guests four cabins comprising a full-beam master suite, a VIP suite, a double and a twin cabin. All guest cabins have entertainment centres, television screens and en suite bathroom facilities while the crew quarters sleep three crew aboard this yacht for sale. A large saloon has comfortable seating on leather sofas, an entertainment centre including a 42-inch retractable television and a separate dining area with seating for eight guests. On the flybridge there is a large al fresco dining area with a U-shaped table, grill area and fridge, all shaded by a hard top, while towards the stern there is a large sundeck. Her top speed is 30.5 knots and she boasts a maximum cruising range of 358 nautical miles with power coming from two 1,948hp MTU 12V2000M94 diesel engines, and has two gyroscopic stabilisers. Flying Visit is asking €2,650,000.